This video was shot during another Tsiknopempti night. In Greece Tsiknopempti symbolises the beginning of 40 days of fasting before Easter and everyone eats meat, lots of it, usually grilled. In Rethymno, my home town, people enjoy gathering in the streets and having small street parties with grilled food and wine or beer. This time joining me is my good friend Anastasia Nazare, a Street Photographer originally from Athens, Greece who was living in Rethymno when we shot the video. Anastasia uses a Ricoh GR which is her prefered camera of choice for shooting in the streets, due to its size and responsiveness combined with awesome image quality. You can scroll to the bottom of the post to check out the link with her photos. In this video I am using my favourite setup which is my trusty old Fujifilm X-Pro1 with my favourite lens, the reliable XF18mm lens that is equivalent to a 28mm full frame lens. In addition I am using the Fujifilm EF-X20 flash for the last time, a compact external flash, especially made for the Fujifilm X-Pro1. Unfortunately this Tsiknopempti street hunt was my Fuji flash’s final swansong as it broke during the course of the evening and I now use a much bigger Yongnuo YN560 Speedlite in its place. For my off camera flashing I am using a cable to connect my flashgun to my camera. We shot and recorded the video during the evening and we spent most of the time in the old town area of Rethymno! During the Street Hunt we had an amazing night full of laughs and as we took a more relaxed approach towards the whole thing, not worrying about our performance at all. This time the video is around 25 minutes long. It is just long enough for you to enjoy your favourite beverage and snack while watching! 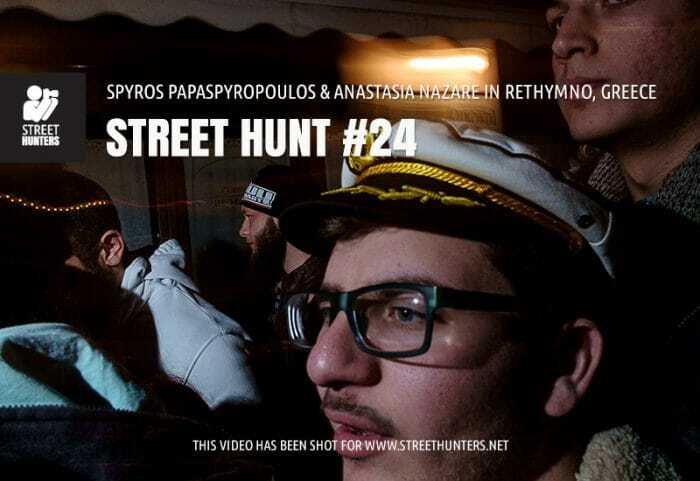 So time to get comfortable and sit back to view this latest street hunt video shot in Rethymno, Greece! If you want to check out each photo I have uploaded every image I shot in a dedicated Dropbox Album called Street Hunt 24. Hi Spyros, what a wonderful to have all the list of the places! Glad you find it useful Sebastiano!